You Can Help Restore Hope and Rebuild Dreams. The Dove Campaign provides support to women and children who need your help to break free from the cycle of crisis. Funding for transitional housing programs has continued to decline, Open Door Mission is addressing this problem head on with the 2017-2018 Dove Campaign. The Dove Campaign supports the Women & Children’s program at 220 Coldwater. It will provide a supportive transitional housing program (6-9 mos.) for women & children with 5 Living units aimed to create an environment that strengthens families, using best practices that address root causes of crisis and preventing re-occurrence, through education, faith, responsibility and independence. The program will focus on job skill training, life and parenting skills, GED support programs and Relief-Restoration-Development. Future plans include acquiring a graduate house with apartments for independent living for up to 2 more years with case management. The Women & Children’s Residential Recovery Program is a grace-based Christian life skills rehabilitation and development program designed to address the root causes of generational poverty through strengthening families. The Women & Children’s Clothing Room is a free clothing distribution and resource center that welcomes women and children in crisis or hardship to receive hope and encouragement. The Community Outreach Program provides support through groups, classes, case management for residents, as well as neighbors in the community, who lack the structure and stability to succeed in the areas of education, employment, spirituality, and family. 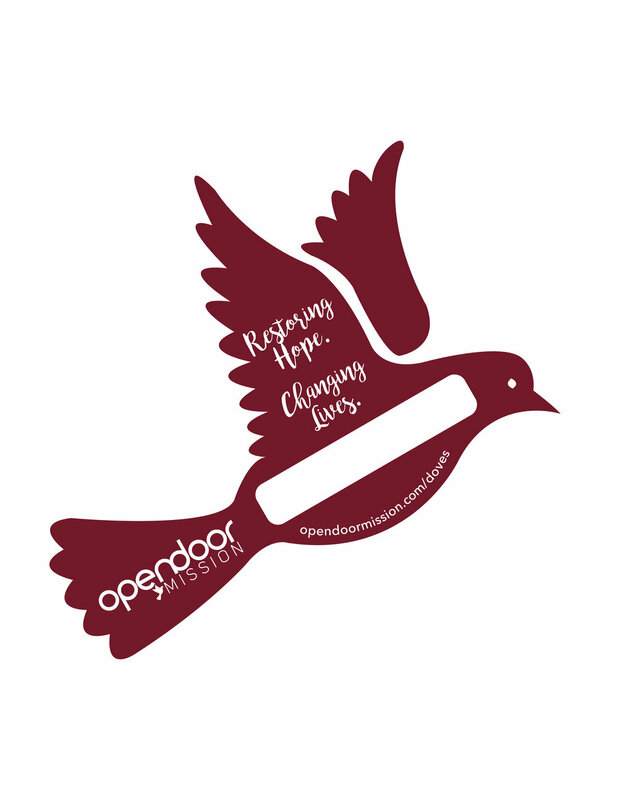 The ODM Dove Campaign represents the love and hope we can spread together in the Rochester community. Posted in local businesses across our region the Doves symbolize our hope for a future without homelessness. Open Door Mission is dedicated to a future where the impoverished men, women and children of Rochester are welcomed with wide arms, a warm meal and a roof over their heads by the entire community. Interested in having Doves posted at your business? Send us a message below for more information.